I sell in USD. If I sold in Canadian the prices would reflect the difference. If a pattern costs $10USD, it would be listed as $12.50CND (depending on the exchange rate) if I sold in CND. I do this so I am not in direct competition with my wholesalers and stores that sell my designs. In most cases I will ship anywhere, feel free to ask if you're not sure. If you are trying to purchase a cross stitch chart and are being charged for shipping please contact me with your country and I can add your country to the shipping exemption option for the PDF files only, which is free! It is not available on the site, but if you know what you want to purchase you can contact me via the contact button at the top or bottom of the page and I can send you a PayPal invoice. Please ensure you include your e-mail address. Do I have to sign up for Stripe to purchase items? No, it is not required to sign up for Stripe to finish your purchase. Are the designs published in the magazines available as PDFs? In most cases yes, the cross stitch patterns will be available as PDF files 6 months after the publication date, however there are some instances where the designs will not be available, but that is rare. Can I make a photo copy to work from or enlarge the pattern so I can see? As long as the photocopy is for your own personal use then yes you may make a working copy for your own stitching pleasure. Please note that you cannot then pass on or sell the original until you are done stitching and have destroyed the working copy. Are the designs available as black and white symbol patters? Yes, they are all available as black and white as most prefer them that way as they are easier to photo copy for working copies. 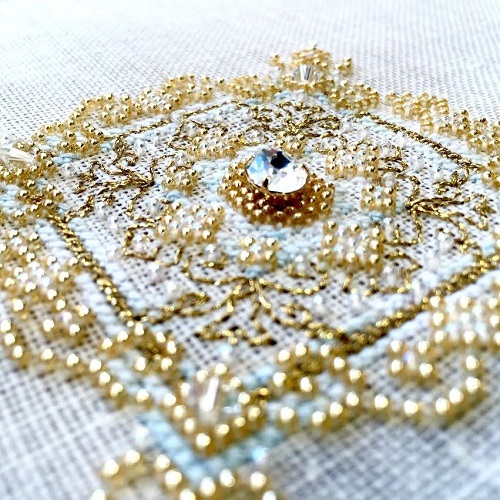 Can I sell my finished stitching of your designs for charity? As long as it is for charity and the stitching isn't mass produced, then yes you may. You may not sell the finished stitching if it is for personal profit. Can I sell your cross stitch patterns when I am done with them? If it is the original, hard-copy issue that was sent in the mail from my distributor then yes you can. If it is a PDF file you cannot sell the patterns as it would violate the copyright on the design. When you send a PDF you are making a virtual copy of the design, it is the same as photocopying the pattern and then selling the photocopies. Have anymore questions? Please contact us using the Contact button at the top or bottom of the page, we will be happy to answer any of your questions pertaining to our products.